BRIDGETOWN, Barbados, Jun 26 2017 (IPS) - A senior European Union (EU) official in the Caribbean said Europe is ready to continue the global leadership on the fight against climate change, including helping the poor and vulnerable countries in the region. Underlining the challenges posed by climate change, Head of the European Union Delegation to Barbados, the Eastern Caribbean States, the OECS, and CARICOM/CARIFORUM, Ambassador Daniela Tramacere made it clear that the EU has no plan to abandon the extraordinary Agreement reached in Paris in 2015 by nearly 200 countries. “Climate change is a challenge we can only tackle together and, since the beginning, Europe has been at the forefront of this collective engagement. Today, more than ever, Europe recognises the necessity to lead the way on its implementation, through effective climate policies and strengthened cooperation to build strong partnerships,” Tramacere said. “Now we must work as partners on its implementation. There can be no complacency. Too much is at stake for our common good. For Europe, dealing with climate change is a matter of political responsibility and multilateral engagement, as well as of security, prevention of conflicts and even radicalisation. In this, the European Union also intends to support the poorest and most vulnerable. “For all these reasons, the European Union will not renegotiate the Paris Agreement. We have spent 20 years negotiating. Now it is time for action, the world’s priority is implementation,” she added. The 2015 Paris deal, which seeks to keep global temperature rises “well below” 2 degrees C, entered into force late last year, binding countries that have ratified it to draw up specific climate change plans. The Caribbean countries, the African, Caribbean and Pacific (ACP) countries and the EU played a key role in the successful negotiations. On June 1 this year, President Donald Trump said he will withdraw the United States from the landmark agreement, spurning pleas from U.S. allies and corporate leaders. The announcement was met with widespread dismay and fears that the decision would put the entire global agreement in peril. But to date, there has been no sign that any other country is preparing to leave the Paris agreement. Tramacere noted that together with the global 2030 Sustainable Development Agenda, the Paris Agreement has the potential to significantly accelerate the economic and societal transformation needed in order to preserve a common future. “As we address climate change with an eye on the future, we picture the creation of countless opportunities, with the establishment of new and better ways of production and consumption, investment and trade and the protection of lives, for the benefit of the planet,” she said. “To accelerate the transition to a climate friendly environment, we have started to strengthen our existing partnerships and to seek and find new alliances, from the world’s largest economies to the most vulnerable island states. From the Arctic to the Sahel, climate change is a reality today, not a remote concept of the future. “However, to deliver the change that is needed and maintain the political momentum, it is vital that the targets pledged by countries and their adaptation priorities are now translated into concrete, actionable policies and measures that involve all sectors of the economy. This is why the EU has decided to channel 40 percent of development funding towards climate-related projects in an effort to accelerate countries’ commitment to the process,” Tramacere said. The EU has provided substantial funding to support climate action in partner countries and Tramacere said it will also continue to encourage and back initiatives in vulnerable countries that are climate relevant as well as safe, sustainable energy sources. For the Caribbean region, grant funding for projects worth 80 million euro is available, Tramacere said, noting that the aim is twofold: to improve resilience to impacts of climate change and natural disasters and to promote energy efficiency and development of renewable energy. “This funding will be complemented by substantial financing of bankable climate change investment programmes from the European Investment Bank and other regional development banks active in the region. 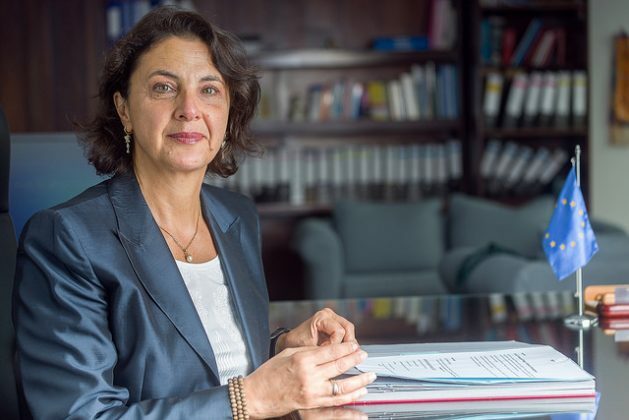 With the Global Climate Change Alliance (GCCA) instrument, the European Union already works with agencies in the Caribbean such as the Organization of Eastern Caribbean States (OECS) or the Caribbean Climate Change Community Center (5C’s),” Tramacere said. In November this year, countries will gather in Bonn for the next UN climate conference – COP23 – to continue to flesh out the work programme for implementing the Paris Agreement. Next year, the facilitative dialogue to be held as part of the UN climate process will be the first opportunity since Paris to assess what has been done concretely to deliver on the commitments made. These are key steps for turning the political agreement reached in Paris into reality. “The challenges identified in the Paris Agreement are of unprecedented breadth and scale. We need enhanced cooperation and coordination between governments, civil society, the private sector and other key actors,” Tramacere said. Caribbean countries are highly vulnerable and a significant rise in global temperatures could lead to reduced arable land, the loss of low-lying islands and coastal regions, and more extreme weather events in many of these countries. Many urban in the region are situated along coasts, and Caribbean islands are susceptible to rising sea levels that would damage infrastructure and contaminate freshwater wetlands.